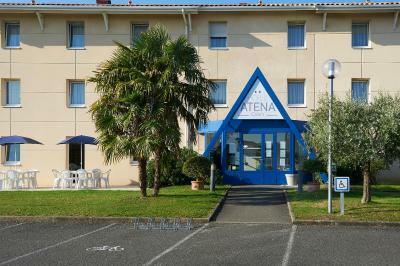 Lock in a great price for Hotel Atena – rated 8.4 by recent guests! Comfortable room with enough space. Good size and extremely clean. 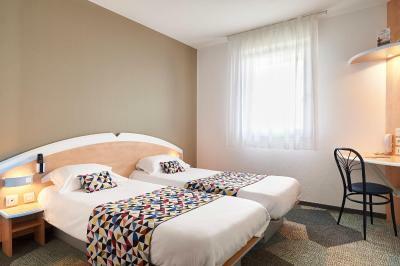 For us it was a brilliant choice because it was right just off our cycle route across France ( la Manche au Méditerranée) , and next door was an excellant restaurant with a comfortable and easy “ formule “ : so we ate and slept very well . They also had an amazing modern sort of access to ready meals in a cabinet . Plenty of parking ( and a secure lock up for our bikes). Brilliant value for money : we have been trying to keep costs down and this was best .. we didn’t have breakfast : went to the square in the village for cafe and croissant . Charming and efficient staff . Convenient, quiet. Well located and clean. It ticks the box! 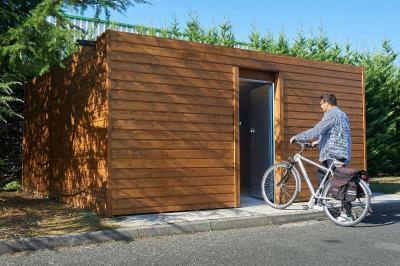 It's in a nice position for access to motorway. Rooms clean. Nice and quiet for a good night's sleep. Location was good, short walk into village. Nice square to have a drink. 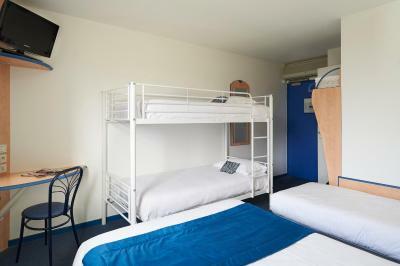 Very comfy beds and room was spotless. Hotel Atena is located in Créon, just 16 mi from the center of Bordeaux and a 30-minute drive from Saint-Emilion. 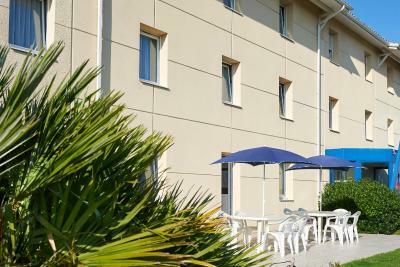 It offers an onsite restaurant and free Wi-Fi access. 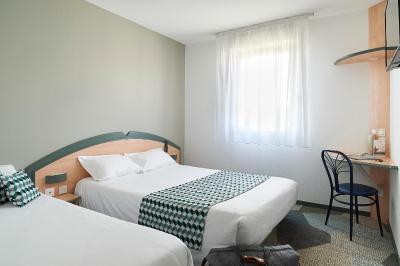 The rooms at Hotel Atena are air-conditioned and have a flat-screen TV with satellite channels. The private bathroom is complete with free toiletries and a shower. 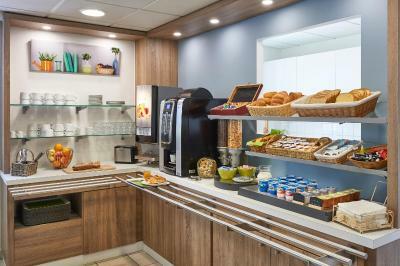 A buffet breakfast is served every morning in reception and a drinks machine is provided near reception. You can also choose to dine in the restaurant and sample traditional-style dishes. 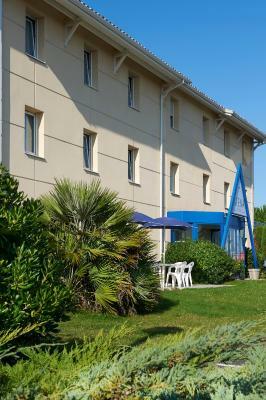 Free private parking and bicycle storage are just some of the other facilities provided at this hotel. 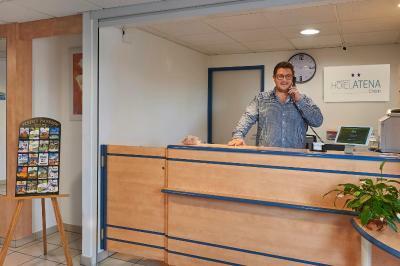 This property is also rated for the best value in Créon! Guests are getting more for their money when compared to other properties in this city. 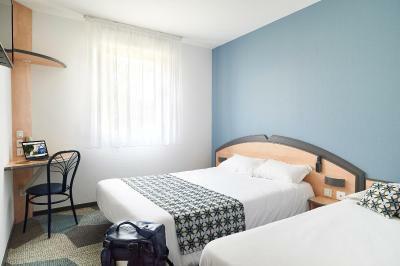 Rooms have free Wi-Fi access and a flat-screen TV with satellite channels. The private bathroom is complete with free toiletries and a shower. 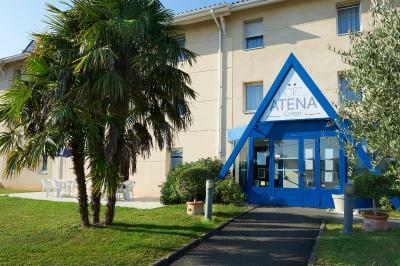 In the vineyard and 25 minutes from Bordeaux Hotel Atena ** welcomes you CREON With Pleasure in the One of our 46 rooms. 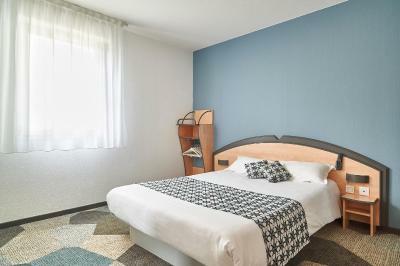 House Rules Hotel Atena takes special requests – add in the next step! 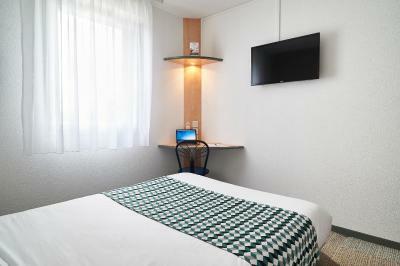 Please note that for arrival after 21:00, you can use the hotel's check-in machine. To access the secure parking, please contact the reception with the contact details provided in your confirmation, between 17:00 and 21:00. 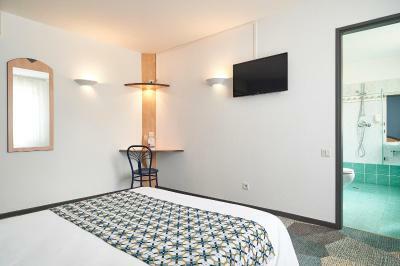 Please inform Hotel Atena of your expected arrival time in advance. You can use the Special Requests box when booking, or contact the property directly using the contact details in your confirmation. Slightly impersonal if you arrive before 5pm. You have to use automated check in machine. No tea or coffee making in room. No bar, just vending machine. There was nothing that I didn't like about the hotel,would stop there again next time I'm passing. Good location easy to find comfy bed. We did not have hot water for a shower and the receptionist in the morning couldn't care less. We weren't offered any type of compensation just a few words and tough luck. 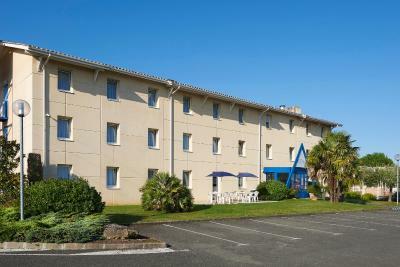 Unfortunately speak very little France and staff very little English. Partly my issue. late arrival entrance by machine breakfast and drinks poor quality dark stairs at.night room was cramped and noisy from neighbouring engineer works after 6am.